NMDA receptor-channel blockers are uncompetitive antagonists because their binding and blocking action requires the receptor-channel to be gated in the open state. Occupancy of a binding site within the ionophore of the channel by these compounds prevents the flux of cations through the ion channel, thus producing a functional block of NMDA-receptor responses (6,7). Unlike competitive NMDA recognition site antagonists (see Section 2.2. 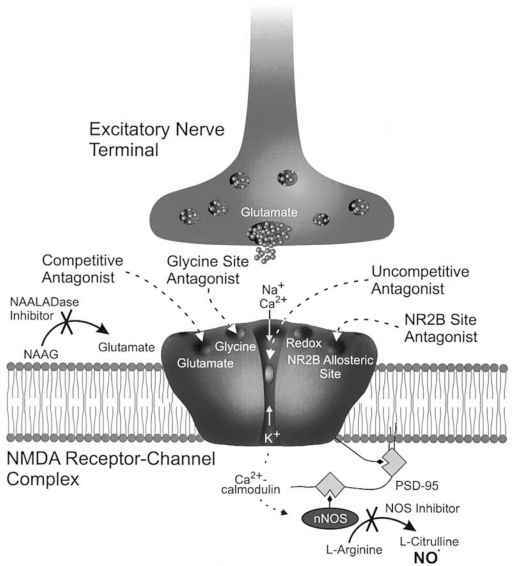 ), uncompetitive antagonists share with other non-competitive antagonists of the NMDA receptor the theoretical advantage that blockade would not be overcome by high synaptic levels of glutamate. An additional potential advantage of uncompetitive antagonists is use dependence, in which the inhibitory action may specifically be potentiated at sites of excessive receptor activation. Nonetheless, these potential advantages may, in some cases, come at the cost of undesirable side effects. Blockade of the NMDA-receptor ion channel can be produced by a host of structurally diverse compounds, including Mg2+, which serves as an endogenous modulator. Compounds that have been studied most extensively (including, in most cases, studies in humans) are listed in Table 1. Uncompetitive antagonists may be divided into two major classes, based on their binding affinities, kinetic characteristics, and side-effect profiles (8). Dissociative anestheticlike compounds, such as dizocilpine (MK-801), phencyclidine (PCP), and aptiganel, generally have blocking affinities below 100 nM, have slower rates of binding and receptor dissociation, and exhibit a high degree of trapping. 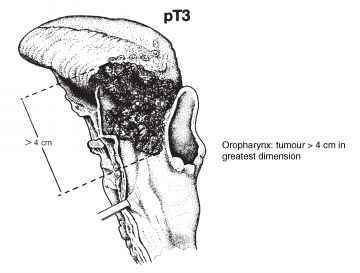 Such compounds have a high behavioral toxicity and a propensity for inducing psychotomimetic effects. Ketamine is a notable exception to this rule in that it exhibits dissociative anestheticlike behavioral properties, but it has a binding affinity in the range of low-affinity channel-blocking compounds that are generally less toxic. Dissociative anestheticlike compounds vary in the degree to which they specifically interact with NMDA receptors to the exclusion of other targets. For example, PCP binds with high affinity not only to the NMDA-receptor ion channel but can also interact with the dopamine transporter (9,10) and voltage-activated potassium channels (11); N-allyl-normetazocine (SKF 10,047) is a high-affinity ligand of both NMDA and sigma receptors (12). 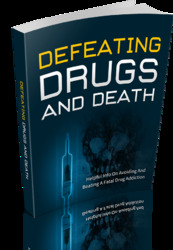 An understanding of the full spectrum of the pharmacological activities of these compounds is critical to assessing their behavioral effects, particularly because sigma receptors and the dopamine uptake carrier have been implicated as targets for drugs of abuse. In contrast to the complex pharmacology of some dissociative anestheticlike agents, dizocilpine is a highly selective uncompetitive NMDA-receptor antagonist and is not known to affect other receptors or ion channels at concentrations comparable to those that block NMDA receptors.